68% of American adults are on Facebook — 3/4 of them daily. If you’re trying to reach your community members — to engage them in a planning process or get them to take action to reach your climate or sustainability goals — social media a clear place to start. But that takes time and resources. What happens when those are in short supply? Our new KLA Social Media and Communications Planning Calendar will help you be more strategic, proactive, efficient and effective. Which got us thinking….wouldn’t everyone benefit from a little guidance and support to jumpstart their social media and communications? 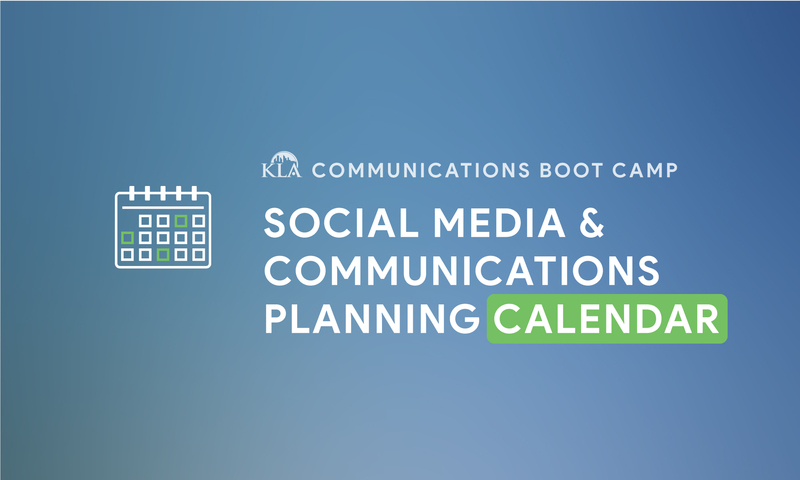 The result is the Social Media and Communications Planning Calendar, part of our KLA Communications Boot Camp series of blog posts, podcasts, guidebooks and trainings to help you take your communications and community outreach to the next level. We are proud to be introducing it at the American Planning Association’s National Planning Conference in San Francisco. Planners love a plan!